<BW> How do you like London? You were here in the late seventies for a concert, how many times have you been here since? 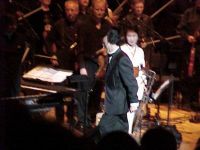 <IT> This [London Genji] concert was the first one after the promo tour in 1978, I have been here since then for personal visits of course, just not concerts. <JB> I'll start off with a general question then. Are you going to perform the "Tale of Genji" elsewhere around the world, maybe in Australia or again in Europe after the success during the week [London Genji]? <IT> I am planning to do more concerts of the Tale of Genji, maybe in a month or so I will know more clearly where these will be held. One approach is from the Vienna Orchestra, who will celebrate their 100th anniversary next year, and the program committee has asked me to perform the Tale of Genji as part of the celebrations, this is still being negotiated. And besides the approach from Vienna Orchestra, in the year 2001, there will be a big Tomita "Sound Cloud" concert including the Tale of Genji at the Danube Park in Linz, Austria. I plan to have all the Japanese instrument soloists playing on a big boat floating in the River Danube, and behind the soloists' boat, there will be a big firework launch by a very famous Japanese firework artist [Seiji Kase]. I was the producer at his firework demonstration two years ago at the same Danube Park [Mozartiana, 13 September, 1997]. That was not my own music, but I did organise the visualisation of Friedrich Gulda's music for the event. So in the year 2001, I would like to have my own big outdoor concert called Tomita Sound Cloud. And why Linz? Because the first of my series of Sound Clouds started in Linz, Austria when I was invited to perform for Ars Electronica in 1984. I had done a concert inside the Bruckner Hall , but then two years later, I organised and performed an outside concert. That was the very beginning of the Tomita Sound Cloud series, so after almost 20 years, I am going back to the same area for a much larger Tomita Sound Cloud / Tale of Genji concert [title to be decided]. This will be an introduction to the fantastic world of one thousand years ago. At this time, it was a peaceful era in Japan [Heian Court period]. There were small fights between people, but no weapons, maybe physical fighting only, and there were no invasions from outside. They were very peaceful days and so, as far as the music was concerned, it was elegant, with almost no rhythms, slow and relaxed. Most of the Japanese music known to the world dates back to little more than 300 years ago, and the drum beat is quiet rhythmic, but that type of music is still quiet young. The music from one thousand years ago is very slow, with a very mild rhythm, and was inherited by the Imperial Court as the music called Garuku. People will understand for the first time at Austria that the music they recognise to be Japanese is different from that in my concert, which will introduce a fantasy from one thousand years ago. Also, this is something which is very important to me, bringing back my Sound Cloud concert to Linz, Austria – to those who are responsible for the entire festival, all the local staff people there, working on audio, lights, etc. I made a connection with the people there, and it's easy for us to work together. For example, one gentleman who was responsible for all the audio systems when I did my first Sound Cloud concert in 1984, he was with the Ars Electronica centre and also ORS Linz. His name is Winkler, and he has been a friend of mine since that time. Then, two years ago, he became head of the Linz events committee and he is now one of the top men at the Brucknerhaus. So most of the staff members from when I was there last are still in the same business but have moved on up the ranks. I am really looking forward to doing that concert in 2001 and getting together with the Linz people again. <IT> There are many places I would like to hold a concert, including as you mentioned the Grand Canyon or the Moon, but if there's no air on the Moon, how would the sound travel! So I have been researching how it would be possible to hold a concert over the Internet or a digital line, because until now, for what is called a "Sound Cloud" concert, I had to organise a huge area covered in sound or music, containing say an audience of 40,000. This is a small space, in which people can enjoy the concert together with an invisible cover of audio / sounds from the helicopter's speaker and also from the speakers in a circle around the audience. But still I am looking to find out what can be done over a digital line, like Ryuichi Sakamoto tried something, with the person in one place, and using digital circuits, there was an unmanned piano performing in a different place. But while an audience can listen to such a concert, this is just a mere showing of the technology. The audience should interpret the content of a concert or else it just becomes a showcase. So still I am wondering, what can be done? I really like the idea of music over a network, a web site, or digital lines. If I can sort out all the questions I have, then a big concert might even be possible from the moon! Then, all the audience on the Earth could enjoy the sound from other planets or else from the other side of the Earth, but still I am not sure how to realise this technically. I would really like to create an emotional acceptance by an audience if I was using a multi-channel network for a concert. For example, when I did the Sound Cloud concert in New York, the big speaker hanging from a helicopter approached from one side, and this corresponded to something coming from another planet [during "Goin' Home", Symphony No. 9]. And the whole audience looked up to see where the sound was coming from, as is in people's natures. In response to the sounds coming from up above, the chorus on the ground started a conversation between Earth and sky. That was a drama - very dramatic - so these kind of dramatic correspondences or responding sounds from other directions might be possible through a network, and this is the question I have to solve. <JB> You mentioned in a recent article that you were working on five Japanese sagas, including the Tales of Genji and Heike – are you going to record or perform any more of those works? <IT> As I told you earlier, the Heian era, which was one thousand years ago, was very, very peaceful even though there were separate powers – power seeking people have always existed. And in order to get power, what was the weapon used? The ability to understand religion, to write and sing songs, to appreciate the fine arts – that was the weapon used by the power seeking people of that time, not a sword. So it was quite easy for me to create a concert based on that era. The samurai class was born after this peaceful Heian era dynasty. That was the dynasty of Heike, and the Heike were the first samurai class. Samurai, as you probably know, have swords, and it then became very violent with fighting between various factions. So this was a very difficult, but very interesting era. In order to write the music, I need a more concrete concept to pick up as a theme. Basically, I am looking for something to start with. During the era of Heike, which brought us the first samurai class and the first Shogun, all of the partaking factions were using swords and there was a lot of violence among the samurai classes. At the time, there was a very stern monarch who obtained his lands through violence - the first dynasty of the Shin era in China. At the beginning of the very famous poem the "Tale of Heike", which was written by an anonymous Buddhist priest, there is a part which translates as "just like the sound of the gong at the temple, nobody can enjoy the luxury of top class power forever." From the eternal point of view, power is just momentary, lasting for seconds. This is a very philosophical poem, and it might be a good theme for me to enlarge into an entire musical story. I am still trying hard to expand this theme. But it takes a long period of time before the actual creation of the music (for those who are wondering and waiting for this work!). <JB> Yes, because we first heard about this in 1984 - there was an interview in Japan Quarterly during which you first mentioned this idea of the Tale of Heike. We also heard that you were working on the "Rite of Spring". Did anything come of that? <IT> *laughs* That was a big mistake! When I planned to start the Rite of Spring, everybody said that music created electronically could not express the depth of powerful human emotions – as experienced in the big festivities of the Rite during the very early days of humans. I vehemently challenged this saying it was not true and that I could create the Rite of Spring. I still believe this now, but it is a very difficult piece to express until you reach the middle of the work. "Still pending"! <JB> In Europe and the USA, a Dolby Surround Sound series of five Tomita CDs was released in 1991. A common question from the fans is why were only five albums re-released, or will more of the older material ("Bermuda Triangle", "Daphnis et Chloe" etc.) be made available on CD again? <IT> I won't be doing any more albums in Dolby Surround. The story behind this series was that when the CD release was being planned, RCA/BMG records in New York met with Dolby Labs and Lucasfilm. One day, I was told that the CDs would be released in Dolby Surround in Europe and the USA. I was glad, but I wanted to know what procedure and what kind of technology was to be used. I was refused this because it was apparently "company confidential" information. So I could not get detailed information on Dolby Surround, and that was the way the CDs came out. Why don't I explain my ideas on surrounding a listener with sound? My idea is that you have an area, say a big space like a studio, with four speakers at each corner. If a listener stands in the centre facing forward, they will hear stereo from the front. If they turn to the side, they should hear stereo from that direction. And if they look to the rear, another stereo sound comes from there too. Therefore, there will be a stereo effect from whichever direction the listener turns towards. With Dolby Surround, if it is a movie theatre, everybody sitting towards the screen experiences stereo from the front, but from the rear, that sound is more monaural. And if someone looks to one side, there is no stereo. So if you think of the environment in a house or outdoors, there is no defined direction for sound. Some people are looking this way, others are looking that way. My idea for a surround system is that all the people can enjoy the same sound no matter what direction they are facing in. With DVD, I will be able to re-release my music for such a system because it has four discrete audio channels. <BW> I have a question related to that. When your early electronic albums were made, some were released in stereo and in Quadraphonic. Is Quadraphonic an improvement on Dolby in your opinion - do you find it better? <IT> Quadraphonic has nothing to do with Dolby. The Victor Company of Japan developed Quadraphonic, and their plan was to have discrete signals for each speaker, so it is really different from Dolby. <BW> Were the Quadraphonic mixes made at the same time as the stereo versions? <IT> Yes, I prepared the two mixes together. The reason I made two types, a quadro mix and a stereo mix, is as follows. If I just used two sets of stereo recordings and joined them for quadro, and if I planned to have a sound movement from right front to the left back, you would not hear it in the combined stereo version, only in true quadro. So in order to prevent the listener from getting bored, I had to have my own different plan for stereo, because if the music is moving between two speakers (front only), stereo is the same as quadro. 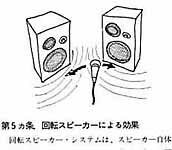 But if the sound moves from front to rear, and it is a stereo joining of left only and right only, there is no sound movement. So I had to make my stereo plan different from my quadro one. <BW> Yes, because in the concert on Tuesday [London Genji], it was very interesting to hear the sounds move around the room, much more interesting than a normal performance. <IT> Not only for part one of the concert [Future Space Fantasy] but it was also used for the Tale of Genji part too. <BW> Was that Quadraphonic sound then, four channel sound? <IT> With the Quadraphonic system, the volume of the speakers changes from left to right. But with the concert on Tuesday, it was based on phase difference – the movement from one phase into other phases [phase relationship]. That resulted in the movement of the sound, and that was using technology acquired from Roland. <BW> And you were using a Roland mixing device, was that for moving the sound or for volume control? <IT> For part one, there was no time for treatment of the music by Roland. I had my own mixes with me and I was just using the equipment to change the volume. But for the Tale of Genji, I prepared everything in advance. For example, the "Spirit" piece [during which the music seemed to whirl around the hall, using an RSS (Roland Sound Space) device] - that was prepared by Roland. And one of the reasons I could not prepare the same system for part one was that the Royal Festival Hall was only available from around midnight of the night before the concert. So the people who installed the monitors and all the speakers worked from 11 at night until the morning, and when everything was set up, it was rehearsal time. So that's why there was no time to organise the Roland treatment of part one. <JB> Is there a possibility that Sound Creature will be released on CD or DVD? <IT> There are no plans to release it on CD because most young musicians are using digital, this was very analogue related! <IT> Do you think there are certain people interested in this technology or these techniques for analogue synthesizers? <IT> I expect that if this material was to be redistributed, it would not be on CD as the market for this would be too small. If people want to get information, they do it through the net. I would be interested in distributing all this information about the old days through the net, because the people who really appreciate this kind of technology are probably among those who subscribe to the net. The CD market ranges from people who have no technology concerns up to computer "freaks"! For those who want to understand the technology, the target market might be through the net. <BW> There would be a lot of interest in that. Many of our questions are from people on Internet newsgroups that are only interested in old synthesizers, for example, one is called "Analogue Heaven". <IT> If I look back, thinking about and listening to stuff from the old albums through to the recent ones, digital synthesizers are quite easy for me to use. People usually have a tendency to use something much easier instead of doing a more difficult job from the beginning. But analogue or Moog synthesizers - it's like if you want to have dinner in a good suit. If it's custom tailored, then that's really something with which you can express yourself. But if it's ready-made, well of course you can buy it very easily, but everybody has the same thing. If I want to express my personality, it's got to be analogue because sometimes even the noise can be included in a recording. Analogue is more human, and therefore more part of my personality. Thinking about analogue synthesizers and the recent high technology digital ones, all synthesizers are like a painter's palette. For example, I myself, or Kitaro, or the old Yellow Magic Orchestra – all these three use the same analogue synthesizers, but the music created by the synthesizer becomes really different for each of the three different characters. But nowadays, if I use a ready-made digital synthesizer, my music becomes quite similar to those who use the same synthesizer. It becomes really boring, and it's also very difficult to express my own strong characteristics. And for that reason, I still like to use analogue synthesizers sometimes.